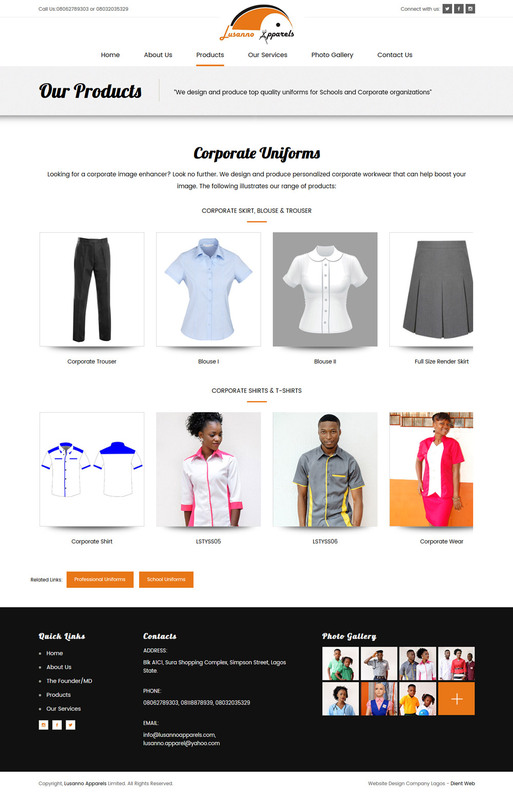 A Mobile Responsive CMS Driven Corporate Website Design for a Garment Manufacturing Company. Lusanno Apparels specializes in designing and producing outfits for schools and corporate organizations. Lusanno is very popular in the world of garment manufacturers. Many agencies and organizations that require professional uniforms for their staff within and outside Nigeria are her clients. The need to redesign her website recently came up and DientWeb was able to develop just what was needed. Our client loves this new website just as we do. It is clean, creative yet simple and easy to use. Do see some screenshots below and visit www.LusannoApparels.com for more.